This bargain stone is the first cut of my Re-Check design - a reflector pavilion with a checker cushion crown. 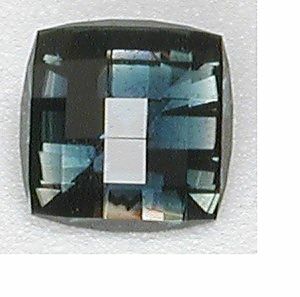 This is a very unique piece offered at a bargain price for a certified "first cut of design", and over one and a quarter carats of weight. Cut from natural Australian rough, the stone is included, though still flashes nicely. 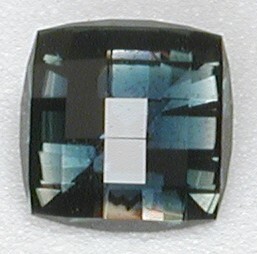 Due to the mix of colors in the rough, this stone tends to flash yellow around the edges and both blue and green toward the middle.